Creation Of Tattoo: Henna Tattoo Design - When Is a Free Hand Pattern "Finished"? Henna Tattoo Design - When Is a Free Hand Pattern "Finished"? 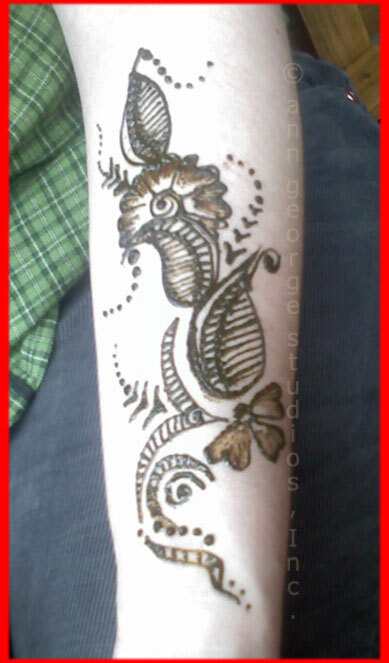 Here is a photo of a henna tattoo for the arm. The pattern is from the wonderful "Sangeet" pattern book available from Tap Dancing Lizard, and the henna by Ann George of Spirit Vision Henna. This pattern took only a few minutes to do, as the paste was very moist, also fragrant, and easy to apply using a henna cone. You will notice the design is eye-catching because both light & heavy lines were used to create the pattern. This henna tattoo also make use of the shading technique to fill in the petals of the flowers. However, it just didn't feel quite finished. You will see that by adding just a few lines at the top of the leaf shaped element on this pattern, the design "comes together" and has a very nice finished look. Sometimes just a few strokes are sufficient to complete a pattern. 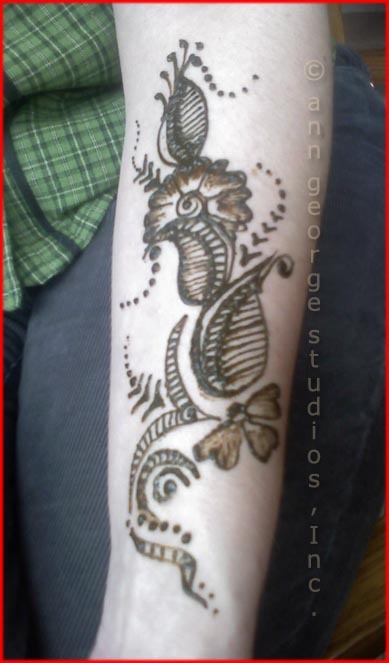 For those of you new to henna tattoo, these images are photos of the henna paste on the skin, and not black henna tattoo. Ann George hand blends here paste fresh for every event, and only pure, natural ingredients are used. If you do have allergies to Indian foods or essential oils, please send a note before coming for your henna tattoo appointment.